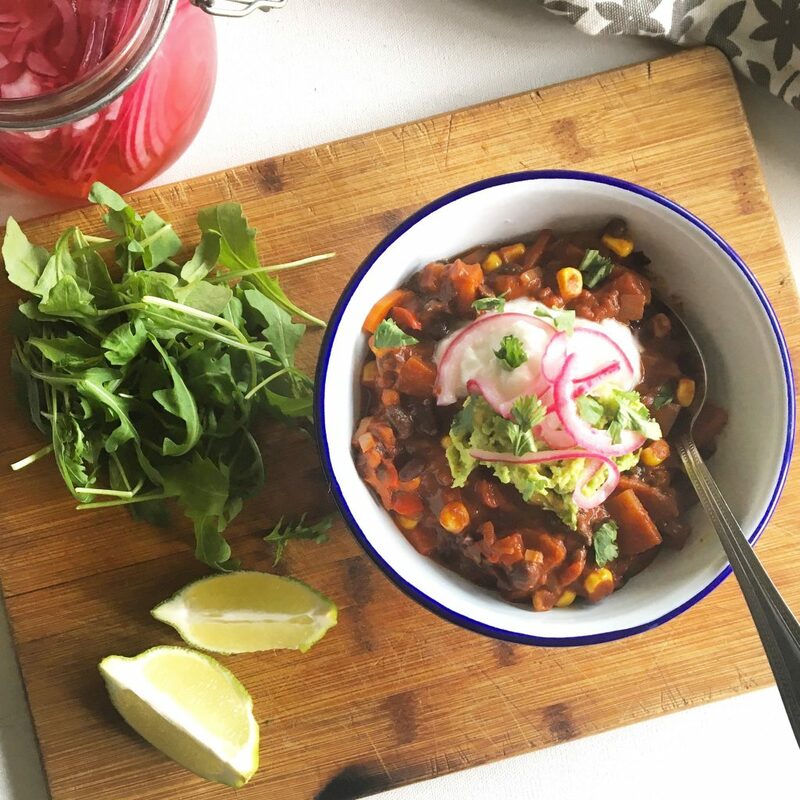 VEGGIE CHILLI!! This is one of my absolute favourite dinners. 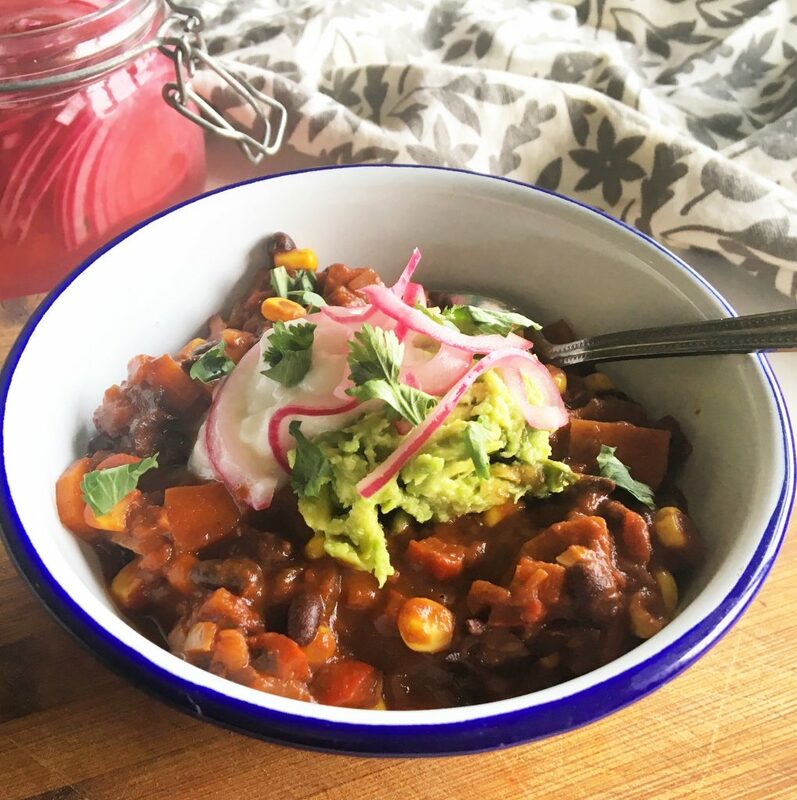 My vegetarian black bean chilli is a warming, nourishing, richly satisfying bowl of spicy deliciousness AND what makes it even more out of this world awesome are the toppings. A sumptuous guacamole that must be heaped lavishly on top and vibrant pink pickled onions that add a magical piquancy. This is amazing on it’s own eaten out of a bowl with some rocket leaves alongside. If you’re really hungry add some brown rice or a baked sweet potato. 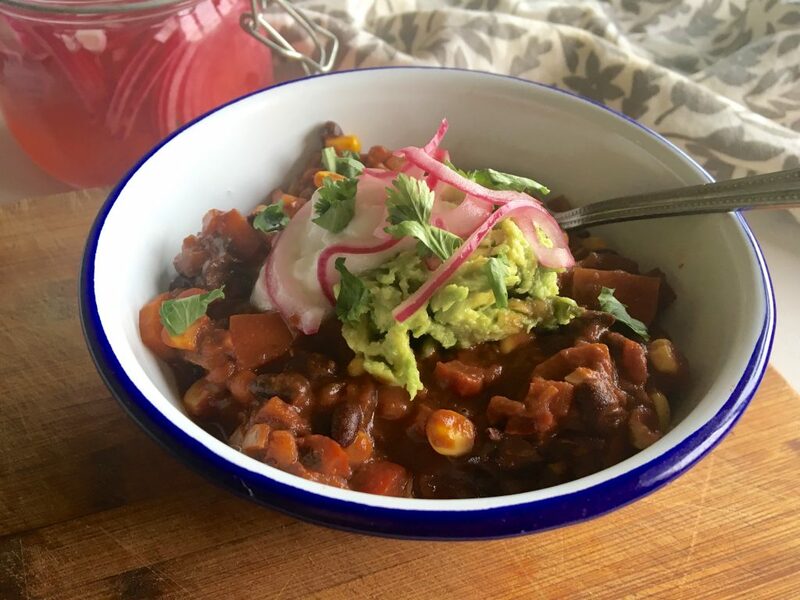 I actually made this chilli for friends last weekend and they really loved it. 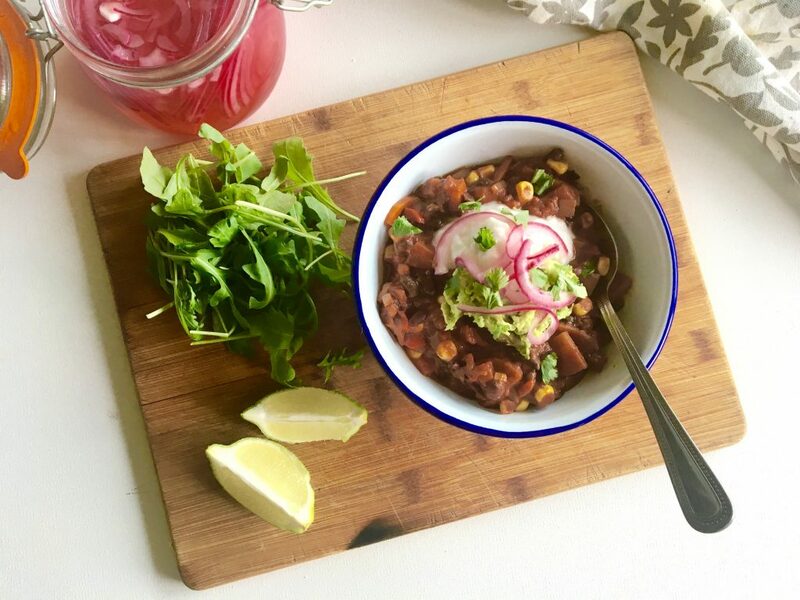 I put the big pan of chilli on the table along with the jar of pickled onions and bowls filled with guacamole, rocket, lime wedges, cooked quinoa and tortilla chips. It looked beautiful and felt like such a feast! If you only make one thing this week make sure it’s this recipe. It’s really easy to make and I know you’re going to love it! Whisk together the vinegar, water, sugar, and salt in a medium bowl or shake it up in a jar. Fry the onion and carrot in a large saucepan on a medium heat with the olive oil. After 5 minutes when the onion has softened, add the garlic, red pepper, chilli, cumin and paprika. Fry for another 5 minutes stirring frequently. Add the black beans, sweetcorn, tomato puree and chopped tomatoes to the saucepan. Put the lid on and cook for 10 minutes. Stir every few minutes to ensure nothing sticks to the bottom of the pan. Add the chocolate, vinegar and marmite to the pan. Cook for another 3 minutes, stirring frequently, until the chocolate has melted. Mash the avocado in a bowl with the lime juice and a pinch of salt. When you’re ready to eat, sprinkle the coriander over the chilli and serve with rocket, avocado and pickled red onions.